One of the joys of what I do is discovering small boutique producers of Pinot Noir. I receive inquiries weekly from new producers and some of them pan out, others have not reached the gold ring yet. In January 2010 I received an e-mail from Macario Montoyo asking to submit his Campesino Cellars Pinot Noir for review. I had no clue who he was but his name piqued my interest. I have had a long-standing attraction to stories of the Mexican immigrant fieldworkers and their success in the California wine business. Macario grew up in the small town of Elmira, near Napa Valley. At the University of Notre Dame, his interest in wine was piqued and after working six years in the corporate world as a financial adviser, he gave up his suit and tie for purple hands and pruning shears, returning to his longings to craft wine. Griselda Montoya grew up in the Carneros region of Napa, always surrounded by vineyards and wine. Her brothers and their spouses founded Ceja Vineyards. She is currently a vice president client manager for Bank of America and as a lover of wine, founded Campensino Cellars with Macario. The Campesino label is quite intriguing, featuring the hands of Griselda’s father, Pablo Ceja. They represent the gnarled hands of a man who labored in the vineyards for forty years after immigrating from Mexico in 1967. Macario commissioned his younger brother, Maceo, an accomplished writer and artist, to draw Pablo’s hands for the label. Campesino (“Camp-pe-si-no”) translates in English as fieldworker. 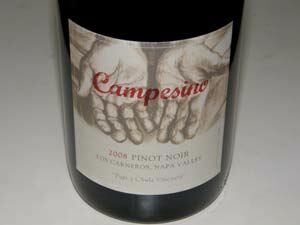 The Campesino Cellars wines are a homage to all campesinos. “A mis carnales y mis carnala gracias por su trabajo”: To my brothers and sisters thank you for your work. Campesino Cellars offers a Sonoma Coast Syrah from Sangiacomo Vineyard and a Napa Carneros Pinot Noir from Papi y Chula Vineyard. The Papi y Chula Vineyard is owned and farmed by the Ceja family, The vineyard is the site where Griselda spent her childhood and where she and Macario were married in 2007. The 5-acre vineyard, which is located but a mile from San Pablo Bay, is farmed by Griselda’s brother, Armando Ceja. Campesino Cellars wines are available through the winery’s online store. Join the mailing list for future releases.